ANNAPOLIS, MD – Rookie attackman Josh Byrne scored five goals and dished off an assist to lead the Chesapeake Bayhawks to a crucial 18-10 defeat of the Florida Launch at Navy-Marine Corps Memorial Stadium on Thursday night. Dynamic attackman Lyle Thompson added three goals and an assist for Chesapeake, which improved its record to 5-6 and made a big move up the standings. Six teams in Major League Lacrosse are now separated by just one game in the win column as the regular season winds down. Attackman Matt Danowki, the team’s offensive quarterback, had two goals and two assists as Chesapeake avenged a heartbreaking 20-19 loss to Florida last Saturday. The Bayhawks now own the tiebreaker with the Launch, which could prove crucial in the tight battle for four playoff spots. “We took care of business. I thought we played with a focus on being a tougher team, being a better team,” Chesapeake head coach Brian Reese said. “I thought we played with a serious sense of urgency, which really helps. Byrne is enjoying a phenomenal first year as a professional and ranks second on the team in scoring with 31 points. Chesapeake’s third-round draft pick out of Hofstra scored seven goals in his MLL debut and had five goals last weekend. Thompson continues to emerge as a real playmaker for Chesapeake, scoring two goals and dishing off an assist during an impressive 7-0 run to close out the first half. The former Albany All-American now has 16 points in four games since joining the Bayhawks after leading the Georgia Swarm to the National Lacrosse League championship. “I think Tucker Durkin is one of, if not the best, cover guys in the league. So that was a tough matchup for Lyle and he stepped up and scored some really big goals. He’s just a special player,” Reese said. Rookie midfielder Jake Froccaro contributed two goals and an assist while long stick midfielder CJ Costabile added a goal and an assist for Chesapeake, which took a 12-6 lead into intermission and maintained control the rest of the way. Niko Amato got the call in goal and responded with arguably his best outing of the season, making nine saves. Amato admitted there was pressure to perform as the Bayhawks may need to win their final four games to get into the playoffs. Chesapeake’s defense rebounded from a subpar outing in which it allowed 20 goals to Florida. Defensive leader Michael Evans led the way while fellow veterans Brian Farrell and Jesse Bernhardt also played well as that unit put the clamps on the Launch. Byrne put the Bayhawks on the board first, finishing a fastbreak by firing a hard overhand shot into the low corner off a nice feed from defenseman Will Koshansky. Short stick defensive midfielder Matt Abbott scored the second goal in spectacular fashion, beating a short stick then shooting while diving over the crease. Byrne used a power move to beat a short stick defender on a strong move to his left hand and scored on another well-placed shot off the hip of goalie Austin Kaut. Danowski lost his defender with a nifty stop-and-go spin move for an unassisted goal and Froccaro came out of the box and got a transition goal off an alert look from Byrne to give Chesapeake a 5-4 lead after one period. The Bayhawks turned it up a notch in the second quarter, outscoring the Launch 7-2 to take a commanding 12-6 lead at halftime. Byrne showed some creativity by batting a loose ball into the cage from the crease to start a 7-0 run to finish off the first half. Farrell provided some major momentum by scoring a 2-point goal in transition. The former Maryland All-American who made his season debut for the Bayhawks last weekend, was trailing the play and took a pass from long stick midfielder CJ Costabile before blasting a hard overhand crank shot into the top corner to make it 8-6. The Bayhawks kept pouring it on from there with Thompson getting into the act with back-to-back goals just 30 seconds apart. Danowski drove from behind and fed Thompson on the left wing for a sidearm shot that slithered past the netminder. Moments later, Thompson drove from the left wing and used a pick to get free for a high-to-low shot that found the back of the net and increased the lead to 10-6. Froccaro went one-on-one with a short stick and used his strength to get inside before dropping down and delivering an absolute cannon blast that Kaut never saw. Byrne closed out the second quarter onslaught by once again bulling his way into the heart of the defense then using a shot fake to fool the defense before unleashing a lefty rocket. Florida scored two goals early in the third quarter to cut the deficit to 12-8, but Chesapeake rebuilt the lead back to six by the end of the stanza. Thompson used a great move to beat his defender then absorbed an illegal check to the neck to score from the doorstep. A huge momentum change came at the end of the period when the Launch shot wide during a power play and that led to a transition goal by the Bayhawks. Rookie midfielder Nick Aponte, who was making his season debut, appeared to be attempting to pass inside to Byrne and the ball somehow wound up in the net. That fluke goal, which fooled Kaut, gave Chesapeake a 14-8 lead going into the final frame. Bernhardt and Costabile sealed the win by scoring consecutive goals just nine seconds apart in the fourth quarter. 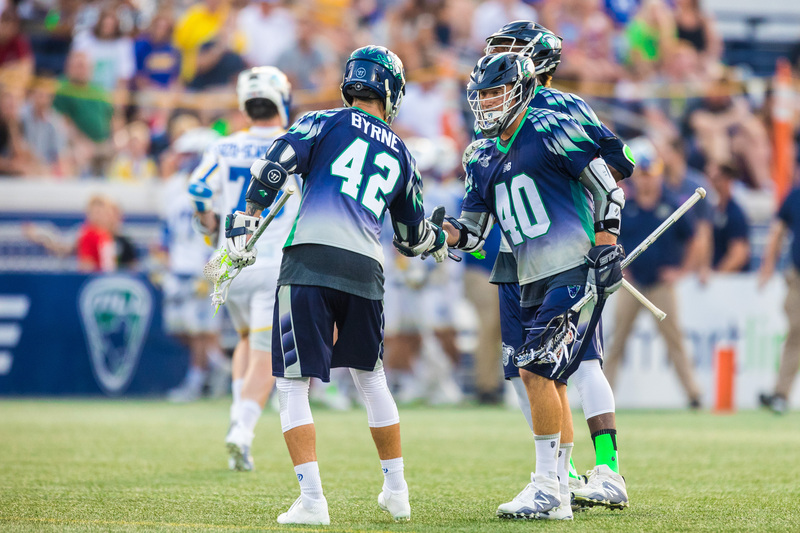 Both players showed tremendous stick skills in dodging past multiple members of the Launch to get into the teeth of the defense for point-blank goals that helped the Bayhawks pull away. “That was a really good team effort right there. We played unselfishly and had everybody clicking,” Farrell said. “We made smart decisions and all the right plays. We talked about hitting singles instead of home runs and that’s exactly what we did tonight. The Bayhawks return home to Navy-Marine Corps Memorial Stadium on Thursday, August 3rd, at 7:30pm versus the Denver Outlaws. For tickets, visit thebayhawks.com, call 866-99-HAWKS or email sales@thebayhawks.com.